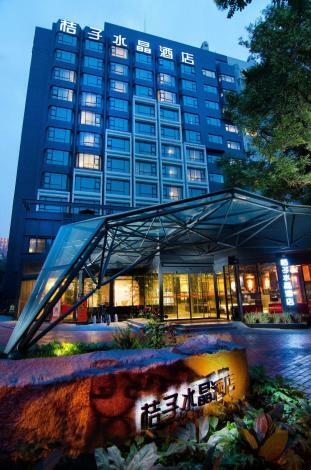 Situated in Chaoyang District's central business district, the Crystal Orange Hotel (Jianguomen Beijing) (Juzi Shuijing Jiudian Beijing Jianguomen Dian) is close to some popular shopping areas and about a 15-minute drive from top Beijing sights including Tian'anmen Square and the Forbidden City and just 3 km (2 mi) from the Beijing Railway Station. Rooms in this Beijing hotel all come with LCD TVs, Kohler bathroom facilities and wireless Internet access. Some select rooms feature bathtubs situated near French windows and others feature rooms with large terraces. Most rooms have dark hard wood floors and nice views. Guests may visit the coffee shop or socialize over a drink in the bar or order room service. Other offerings include a ticket office, free parking and a free map.